Scroll down for a list of the counties we service. Tunnels and runs: Most likely noticed during the spring or fall. If you have experienced crop damage (root damage) it is more likely to be a vole and not a mole. Moles are after earthworms and grubs, while the vole is after the edible roots. A mole may damage the root system while digging a tunnel but usually dose not eat them. Moles have no ears. Voles have small but visible ears. A moles nose is naked. Voles have fury noses. Moles have shovel/rake like feet. Voles have feet like mice. 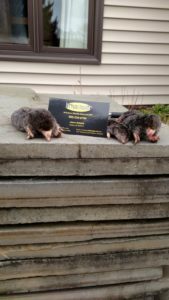 If you are currently in need of mole control? Then it is time to give Eviction Nuisance Wildlife Control a call today. We will inspect the area, and work with you to solve the problem.